So, I am brainstorming for a new post and I have so many ideas. Like deep blog posts that I wanna do, but I think they may will turn too deep or mean. So I’ve decided to do another song type blog, if you’ve followed my blog from the beginning you’ll remind my post, one of my favorite, about the song “All too well” by Taylor Swift. As much as I’d love to do another post with loads of songs from her, because she keeps writing about my life, and I might do one sooner or later, I’ve decided to do a Christmas one. It’s actually more personal than general, i’ll pick some of the most famous songs and just a few lines from them. 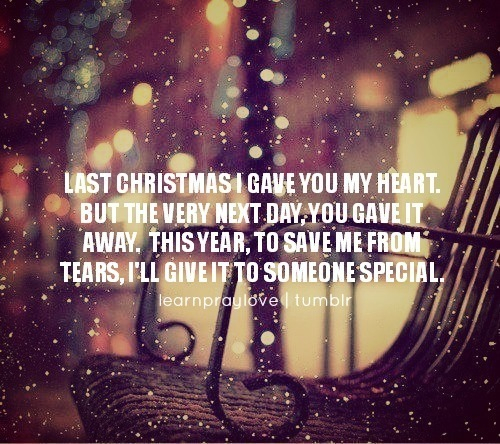 “Last Christmas I gave you my heart but the very next day you gave it away. I was listening to the song this year while I was working and it just came in my mind, it’s really something unbelievable when suddenly a song speaks to you, so I’ve started laughing and I said to my colleagues that I just loved the song and when I came back home, instead, I told to my best friend that this song it was so true this year more than the previous ones. Last year, on Christmas time, I was with my family but my mind was in London, because of someone else, that someone else that broke up with me after a few days that I came back. So this year, I’ve decided to give my heart to myself, to my family, to my friends. They are definitely more worth it. First of all, as much as I love the original one, Michael Buble’s version is my favorite. Anyway, the story about this song is that every year I have a different crush so every year I sing this song to someone different haha but how can you not love this song? It’s just pure LOVE. Can’t wait to go home for Christmas. You gotta love this atmosphere of happiness and family, and warm and food and just everything seems right. And there is the song that makes me always emotional, the one that I think describe perfectly what is Christmas: Do they know it’s Christmas? You should buy it, they always do it for charity, every year is for a different cause. We have so much and we could give more with just a little thing. So be nice and give a lot because even if you have everything, it doesn’t mean that the other are that lucky.